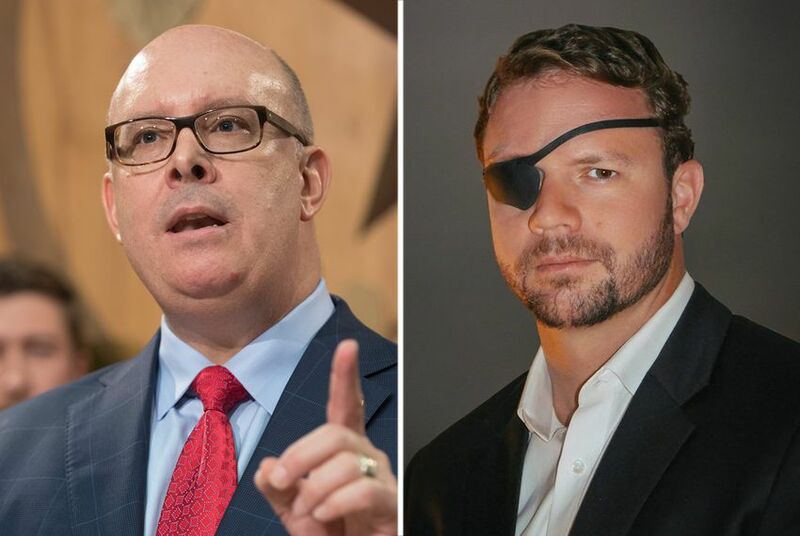 While little separates veteran Dan Crenshaw and state Rep. Kevin Roberts on policy, their Republican runoff has grown nasty as they argue over past Facebook posts and accusations of mudslinging. The winner is likely to end up in Congress. HOUSTON – With just days to go before Tuesday's runoffs in Texas, candidates across the state are sharpening their attacks, hoping to differentiate themselves from rivals. But the GOP race in Houston's 2nd Congressional District may be where the candidates are getting on each other's nerves the most. The two Republicans vying to replace retiring U.S. Rep. Ted Poe, R-Houston, offer a striking contrast. Kevin Roberts is a first-term state representative who is originally from the Panhandle. He shares his cell phone number with constituents and touts his business background as an executive director at a law firm. Dan Crenshaw is a retired Navy SEAL and graduate of Harvard’s John F. Kennedy School of Government who lost his eye while serving in Afghanistan. His fundraising trailed other contenders in the first round of the primary, but his eyepatch and glass eye in his signage served as a subtle but effective reminder to potential GOP voters of his military service. The two men track fairly closely on policy – both campaigns say flood mitigation and border security are the top issues in the district, which was hit by Hurricane Harvey last year. Both are running under a similar banner of conservatism in this GOP stronghold. But those similarities belie the tone in this race. Roberts can quote old Crenshaw Facebook posts and policy pages on Crenshaw's website with the fluency of an English teacher recalling Byron. Roberts has charged that Crenshaw intends to raise taxes in order to preserve Social Security and that Crenshaw has in the past posted "demeaning" comments about Christianity. Crenshaw is similarly fluent in Roberts' shots at his record, and he charges back that Roberts is twisting statements and positions out of context. He further says those attacks have been what defined his opponent in the runoff to voters. “Even the outside groups [involved in the race] ... I’ve not seen anything from that that talks about Kevin in a negative way except for, ‘Look at all the mudslinging he’s doing,'” Crenshaw said. “I mean, I think it’s okay to defend ourselves, and say, ‘He’s doing all the mudslinging, we’re not." The district begins in the northeast Houston suburbs and wraps around the outskirts of the city counterclockwise before ending deep into the heart of Houston from the west. By all objective analysis, this is safe GOP territory and the winner of this runoff will likely become a member of Congress. Roberts placed first in the March 6 primary with 33 percent of the vote, with Crenshaw narrowly winning second place with 27 percent of the vote. That a runoff was even needed was something of a shock: GOP fundraiser Kathaleen Wall spent a stunning $6 million on her bid, prompting speculation she would draw enough votes to win the seat outright. She ended up coming in third, trailing Crenshaw on election night by a mere 145 votes. In the runoff, Crenshaw has led in fundraising, raising $247,000 to Roberts’ $191,000. Crenshaw is currently at a slight cash-on-hand advantage, according to the most recent reports. Both men credit retail politicking for their first-round success. In the runoff, outside groups have poured more money into the race. Conservative Results Matter, a group aligned with Roberts and the law firm where he works and that his brother-in-law founded, has spent $616,000 — all of it attacking Crenshaw — while American Patriots PAC, a pro-Crenshaw group, is up to $386,000. Out of nowhere late this week, former Lt. Gov. David Dewhurst, a voter in the district, emerged from a 16-month Twitter slumber to enter the fray after apparently receiving an anti-Crenshaw piece of direct mail. “I can't keep quiet watching the race for #CD2, with Kevin Roberts, an office manager for a plaintiff’s law firm, lying about his opponent Dan Crenshaw, a distinguished #veteran & former @USNavy #SEAL who lost his right eye in Afghanistan,” he wrote. The source of the mailer is unclear, but Dewhurst’s description of it as comparing Crenshaw to U.S. Sen. Bernie Sanders, I-Vermont, and former President Barack Obama falls in line with attacks an anti-Crenshaw super PAC has deployed. It was Dewhurst’s first tweet from the account in over a year. One of the biggest points of contention in the contest is President Donald Trump. Roberts told The Texas Tribune he backed Trump during the 2016 primary when he was a candidate for state representative a time when most Texas politicians backed U.S. Sen. Ted Cruz, former Florida Gov. Jeb Bush or U.S. Sen. Marco Rubio of Florida. “I supported President Trump from the get-go go because of his business experience,” said Roberts. Crenshaw was still in the service during the 2016 primary and was not active in Texas politics at the time. In 2015, Crenshaw called Trump's rhetoric about Muslims "insane" and "hateful." But he now says he strongly supports the president. While much of CD-2 is conservative, there are pockets of diversity and progressivism. When pressed on if Trump’s contentious statements might offend future constituents, both men argued there was a difference between supporting Trump’s agenda and his incendiary style. “What I mean in terms of support is, on good policy, I want to be a part of helping move good policy to get results,” said Roberts. “I’m not engaging or condoning anything he has said or done,” he added. “As a Christian, it’s not my job to judge his heart. I don’t have to agree with what he says or his actions." Whoever carries the day on Tuesday night has a good chance of representing the 2nd Congressional District. That said, a Democratic candidate named Todd Litton has been quietly building his cash reserves and impressing the local party establishment. As of his latest financial report, Litton had about a quarter of a million dollars in cash on hand. And while many Houston Democratic players who were interviewed by the Tribune say they do not believe this seat will come online next fall, they’re nonetheless impressed with the operation Litton put together. National Democrats are cautiously watching the district in the event a historic Democratic wave appears poised to wipe out Republicans who were once thought to be on high ground. Roberts and Crenshaw insist this is a reliable Republican seat – but each promises to be ready in the fall to forcefully defend it, should he be the nominee. “If I’m successful and voters make the decision that I’m the right guy, then I’ll make the turn and I’ll look to that,“ said Roberts.